Anello di conversione, Raccordo, Adattatore obiettivi Olympus OM a fotocamere innesto NIKON N1. Consente di montare tutti gli obbiettivi fotografici, telescopi, microscopi, ed altri strumenti ottici con attacco fotografico Olympus OM sulle focamere innestoNIKON N1. Gli obiettivi fotografici innesto Olympus OM montati sulle fotacamere NIKON N1 conservano la messa a fuoco all'infinito. Nota, non si ha nessuna tramissioni di automatismi. Si fotografa in manuale . Attenzione : per poter utilizzare il raccordo, assicurarsi di aver installato sulla fotocamera il firmware per il funzionamento di anelli adattatori. 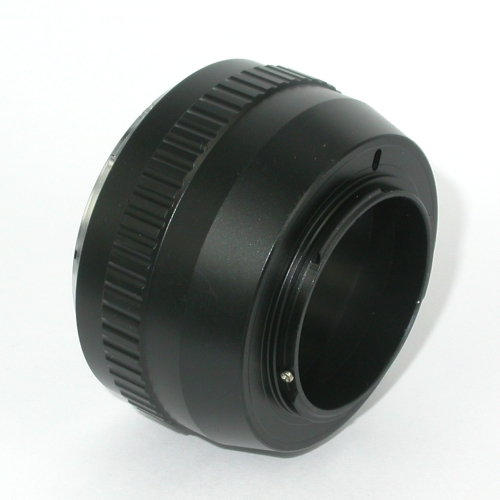 Ring of conversion, Link, Adapter objective Olympus OM graft NIKON N1. It allows to climb on all the objectives, telescopes, microscopes and other optic tools with photographic attack Olympus OM on the serious focameres NIKON N1. The photographic objectives Olympus OM climbed on on the photocameras NIKON N1 preserve the mass to fire to the endless one. Note, any tramissions of automatisms is not had. You photographs in manual. Warning: to use the connection, make sure you have installed the firmware on the camera for the operation of adapter rings.